Other products manufactured and/or service-rendered under the Canon brand may not appear here. Such products may include office or industrial application devices, wireless LAN products, and semiconductor and precision products. Canon J (1939) J stands for Junior a non-rangefinder model. In 1956, Canon departed from the Leica II Style and developed a more contemporary look, along with a Contax style self-timer level to the left of the lens mount. 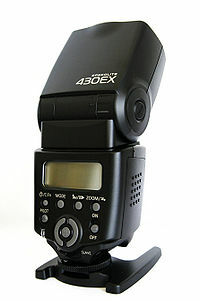 This was the first Canon camera with a swing-open camera back for film loading. Upper end models had a new three-mode viewfinders and winding triggers. Canon 7 (1961) Including a built-in meter and improved viewfinder system. Canon partnered with US manufacturer Bell & Howell between 1961–1976 and a few Canon products were sold in the US under the Bell & Howell brand e.g. Canon 7 Rangefinder, Canon EX-EE, and the Canon TX. Canon developed and produced the Canon R lens mount for film SLR cameras in 1959. The FL lens mount replaced R-mounts in 1964. Canonflex (1959) - Planned as Canon's first professional-class SLR camera body, but it was not successful. Available with builtin motor-drive option (not detachable). Canon developed and produced the Canon FL lens-mount standard for film SLR cameras from 1964 to replace the Canon R lens-mount standard. The FD lens mount standard replaced FL-mounts in 1971. In 1969 Canon introduced an economy camera/lens system where the rear three elements (in two groups) were built-on-to the camera, and several front element options could be interchanged. This had been used by Zeiss-Ikon in their mid-level cameras of their Contaflex series, and by Kodak in early interchangeable lenses for the top-end Retina series (later going to full lenses). Canon offered four lens options: 35mm f/3.5, 50mm f/1.8, 95mm f/3.5, and 1255mm f/3.5. Through the lens metering was center weighted and automatic exposure was shutter speed priority. Only two cameras were offered and the line was not successful. Canon developed and produced the Canon FD lens mount standard for film SLR cameras from 1971 to replace the FL lens mount standard. The FD mount had two variants – original lenses used a breechlock collar to mount whilst later versions used a standard bayonet twist lock with a short twist action. The EF lens mount standard superseded FD-mounts in 1987. Canon ceased to produce FD-mount cameras in 1994. Canon F-1 (1971) - Reputed as Canon's first successful professional-class SLR camera body. The 1959 Canonflex professional camera system (above) failed and was down-featured for the consumer market. In 1987, Canon introduced the EOS Single-lens reflex camera system along with the EF lens-mount standard to replace the 16-year-old FD lens-mount standard; EOS became the sole SLR camera-system used by Canon today[update]. 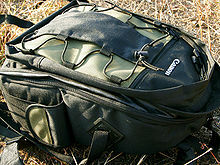 Canon also used EOS for its digital SLR cameras. 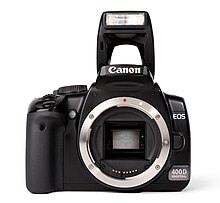 All current film and digital SLR cameras produced by Canon today[update] use the EOS autofocus system. Canon introduced this system in 1987 along with the EF lens mount standard. The last non-EOS based SLR camera produced by Canon, the Canon T90 of 1986, is widely regarded as the template for the EOS line of camera bodies, although the T90 employed the older FD lens-mount standard. 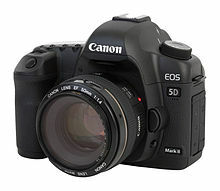 For a detailed list of EOS Film and digital SLR cameras, see Canon EOS. Canon PowerShot SD640 No reference that this camera exist. Canon Powershot A540, photographed using itself and a mirror. The 300T is a layover from the FD system, it was introduced with the FD mount Canon T90, but is compatible in TTL mode with most non-digital EF cameras. Manufactured 2007 to 2013. The "iR" series uses Ultra Fast Rendering (UFR) printing system, and some models use UFR II, a page description language. StarWriter Jet 300 — a word processor and Personal Publishing System. Beginning in Spring 1993, Canon produced a series of notebooks with integrated inkjet printers called NoteJet. The initial price for the first-model NoteJet was U.S. $2,499. The NoteJet lineup was eventually discontinued, and computers belonging to the series are valued by collectors. Canon printers are supplied with Canon Advanced Printing Technology (CAPT), a printer driver software-stack developed by Canon. The company claims that its use of data compression reduces their printer's memory requirement, good quality compared to conventional laser printers, and also claim that it increases the data transfer rate when printing high-resolution graphics. Canon PJ-1080A colour inkjet - which was also available under another brandname. Since about 2005 Canon introduced a numbering scheme for some whereby the least significant (non-zero) digit signifies the geographic region (“3” signifying Japan) the device is sold in. This leads to a large number of models, all belonging to the same family, but possibly incompatible to some degree, and also makes it difficult to ascertain whether a device is unique or part of an existing family. The software driver filename will often use the family designation. See Canon EF lenses for the product line-up. See Canon EF-S lenses for the product line-up. EF-S lenses are built for APS-C 1.6x crop sensors, so it will only work with models that use this sensor size, such as: Canon EOS Digital Rebel series (300D through 750D and 760D, 100D, and 1000D through 1200D), and newer cameras in the prosumer Canon EOS Digital series (20D through 80D, 20Da, 60Da, 7D, and 7D MkII). When EF-S lenses are used on a 35mm (full frame) camera, the back element will hit the mirror assembly or cause massive amounts of vignetting since the sensor is bigger than the image produced by the lens. See Canon FD lenses for the product line-up. Note: Even though the tilt-shift and dedicated macro lenses are designated TS-E and MP-E respectively, these lenses are still compatible with the EF mount. PhotoStitch - image stitching software, used to join multiple photographs together to produce a composite pictures such as panoramas. Zoombrowser EX - Image organizer utility for viewing and transferring photos from digital camera to desktop computer. Digital Photo Professional is available for asset management and editing of downloaded images. CameraWindow DC - Image Downloader utility for transferring photos from digital camera to desktop computer (used by Zoombrowser EX). Canon TrueType Font Pack is a floppy disk collection of supplementar truetype fonts for some Canon printers of years '90 and useful for Windows 3.1 and 95. ^ a b c d e f g h i j k l m n o p q r s t Canon Inc. (May 30, 1978). Canon Customer Service Counter Book-1 Photo Products (1935 - 1977). Minato-ku, Tokyo 108 Japan: Camera Service Division, Camera Service Department. 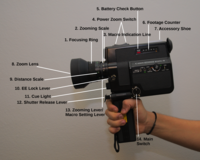 ^ "The Canon Cine 8S 8mm Movie Camera". ^ "Canon shows off new PowerShot N100 'Story Camera'". January 6, 2014. ^ Lewis, Peter H. (1993-04-19). "Canon laptop has a built-in ink-jet printer". Baltimore Sun. Retrieved 2014-04-28. 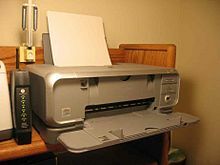 "Technology Used in Laser Printers". Canon. Retrieved 2011-07-17. Shell, Bob (1994). Canon Compendium: Handbook of the Canon System. United Kingdom: Hove Books. pp. 192pp ill. ISBN 978-1-897802-04-5.